Recent policy reforms throughout the world have altered the sugar landscape and many of the traditional variables have been upended. This year we will examine the processes, results and perspectives in key areas with first-hand impressions from the relevant stakeholders, complemented by analysis from experienced professionals that will enrich the understanding of the profound scope these changes encompass. Sugar is a soft commodity, which is produced, traded and consumed all around the world. The sugar cane or sugar beets are the raw materials from which farmers can produce sugar. We use sugar widely in everything from food to industrial applications. Sugar can be produced and/or refined many countries and finds its way in different forms, for different purposes to different destinations. For this reason sugar has a prominent position in the commodity trade environment and how sugar price affects trading procedures, is something which sugar traders need to know about. Looking at the country origins of sugar as a raw material, the top producers of are Brazil, India, China, Thailand and Pakistan and the EU as a group. When you are thinking to trade sugar commodities the mayor things to consider besides the logistics chain are the price drivers of sugar itself. Looking at just at sugar prices graphs is not enough to understand sugar markets, you need to take into account the factors that drive the sugar prices. So, which are the most critical price drivers for trading sugar commodities? This is a factor actually that affects all commodities. Likewise for sugar, low levels of stocks indicate strong demand, weak supply or a combination of the two. Because of the long supply cycle of sugar, whenever there is a problem in terms of storing the sugar commodities, then there is also a significant effect in sugar price. US dollar is the main currency, which people use in financial transactions. This actually is the same for most of the commodities and especially for sugar as sugar derivatives are priced in dollars both in London and New York. A decrease in the value of US dollar relative to a commodity buyer’s currency can cause headache to the finance counselors of trading companies. Why? Because in this way the one who buys should spend less of their own currency for a certain amount of the commodity. A less expensive commodity is the reason for an increase in the demand and as well in the price. Another important factor which influences the price of sugar is oil price. This is because sugar can be considered an energy source. The value of an energy source depends on the caloric value of the source and the energy price. The latter is dominated by the oil price. This is not theory; in practice the sugar cane farmers in Brazil can produce sugar or ethanol from their cane. The ethanol, competes with gasoline in the transport fuel market. Thus a decrease in gasoline’s price will also mean a decrease in ethanol prices and hence less demand on sugar cane to produce ethanol, thus potentially an oversupply of raw sugar. And an abundance of raw sugar wil bring sugar prices down. As mentioned before countries with warm climate produce sugar mainly. However, imagine that a warm climate can also be “too warm” for sugar. A drought in Brazil, for example, can damage sugar canes and make the production cycle roll slower. While too warm atmosphere can cause problems, also wet weather is not ideal for producing sugar. Sugar canes require dry atmosphere. Malfunctions in the production cycle due to weather conditions are another driving factor in sugar price. Governmental contributions and import tariffs are playing also a role in the game of sugar trading. Governments have twisted the sugar markets and the result is the excessive production of sugar cane. Europe today is the second larger sugar exporter in the world. In US though, import tariffs are meant to protect domestic farmers, so prices for US consumers have been raised. This is also why US consumers now are looking for different types of sweeteners. Most of us like sugar. Sugar is everywhere it provides us physical energy and makes food taste good. As the world population is growing the sugar consumption is most likely to grow. But sugar is also responsible for various health concerns such as obesity, diabetes and dental health. Governments and institutions have started educating consumers and as a result consumers are becoming more aware of the health aspects of sugar. 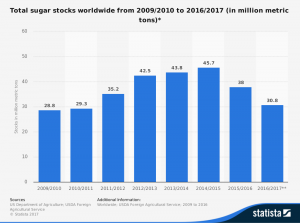 Since the trends for healthier nutrition gets more momentum in the mature sugar markets, this could possibly slow down the growth in sugar demand in the future. The commodity price volatility and price trends are the first thing that traders and financial managers are monitoring in their daily operations and risk management. The second is the exposure they have to these markets as a result of their contracts, price & margin strategies and no to forget their cash flow projections. In addition a large scale of hedging instruments is available such at Futures, Options and OTC where in sugar specific mechanisms play a role such as “white premium” and “polarization premium”. These are complex processes due to the variety of variables and their dependencies and correlations. A good way to manage price and margin risks of a sugar business starts with implementing the right technology to support it. A general ERP system is mostly not the right tool for managing a commodity business. We advise to choose an application specific to your sugar trading businesses, and when in trading of managing price risks with futures contracts, select CTRM software made for sugar trading.